WASHINGTON, DC, July 26, 2012 (ENS) – People across the United States and Canada this week are marking the two-year anniversary of the Kalamazoo River tar sands oil spill with demonstrations, candlelight vigils and news conferences that all deliver a single message – a similar spill could happen anywhere pipelines run. On Sunday, July 25, 2010, at about 5:58 pm, a 30 inch-diameter pipeline owned and operated by the Canadian company Enbridge Inc. ruptured and spilled crude oil into an ecologically sensitive area near Michigan’s Kalamazoo River. The spill continued for 17 hours until a local utility worker discovered the oil and contacted Enbridge to report the rupture. The 843,444 gallon spill, enough of the sludgy, corrosive oil to fill 120 tanker trucks, is still being cleaned up. 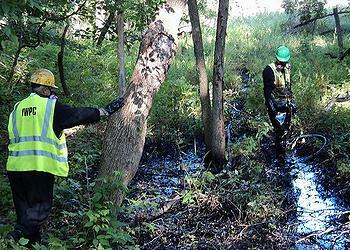 At a cost of more than $800 million it stands as the costliest pipeline cleanup in American history. Enbridge Energy, based in Calgary, Alberta, plans to expand that same pipeline and pump three times more heavy oil from the Alberta tar sands through it than it currently carries. The company plans to connect the pipeline in Michigan to east coast lines to create an international tar sands pipeline network. The Kalamazoo River spill was caused by, “Pervasive organizational failures by a pipeline operator along with weak federal regulations,” the National Transportation Safety Board said in a scathing report issued on July 10. On July 3, the U.S. Department of Transportation’s Pipeline and Hazardous Materials Safety Administration proposed a $3.7 million fine against Enbridge after its investigation found 24 violations of safety regulations. New England activists are up in arms against a plan by energy companies to convert an existing gas pipeline to carry the heavy, corrosive fuel from Alberta to markets on the Eastern Seaboard. In Burlington, Vermont on Sunday, the Sierra Club, 350.org Vermont, and Tar Sands Free Northeast are organizing the largest We Are the Kalamazoo rally – a “human oil spill” outside the Conference of New England Governors and Eastern Canadian Premiers. As hundreds of people have registered to attend, it is shaping up to be one of the biggest regional environmental protests in years, featuring environmental activist Bill McKibben, a Vermont resident who founded the climate action group 350.org and Innu native people from northern Quebec. The first action of the We Are the Kalamazoo campaign was a human oil spill at the state capitol in Lansing, Michigan on July 18, when about 30 environmentalists in black clothing sprawled on the glass floor of the rotunda at the Michigan Capitol. In Maine, citizens participated in one of four different rallies dramatize the risk a tar sands pipeline spill poses to drinking water, fisheries and tourism. At least 40 attended a rally at Sebago Lake, more than 100 attended a rally in South Portland at Casco Bay near a tanker terminal, 50 joined a human oil spill on the Androscoggin River in Bethel, and 50 joined a demonstration in Bolsters Mills on the Crooked River. Nebraska is now in the process of identifying a route that would protect the Ogllala aquifer from the Keystone XL pipeline proposed by TransCanada to carry tar sands oil to refineries in Oklahoma and Texas. Deb Miller is a resident and store owner in Ceresco, Michigan who lives just 4.5 miles from the Enbridge pipeline break along the river. She told reporters on a conference call Wednesday that she was on chemotherapy when the spill occurred. Miller said local officials told residents their biggest concern was benzene. The Department of Health and Human Services classifies benzene as a human carcinogen. Residents worry about the long-term health effects of exposure to the oil and Miller is upset that the state of Michigan has determined it is not necessary to do a long term health study. The spill of heavy crude oil affected about 36 miles of the Kalamazoo River. While a majority of the spilled oil has been recovered, oil remains “in floodplains, on riverbanks, in the sediment at the bottom of the Kalamazoo River, and in Morrow Lake,” according to a report issued in May by the Michigan Department of Community Health. “MDCH has concluded that repeated skin contact with and accidently eating small amounts of sediment containing submerged oil will not result in a higher than normal risk of cancer,” the agency said. On July 10, Michigan authorities opened 35 miles of the Kalamazoo River to the public, but the oil is not gone. At five locations along the affected stretch of the river, they have wipe stations for swimmers to remove oil from their bodies and their boats. Canadians are also fighting tar sands pipelines. In Toronto, Ontario on Wednesday, photographs of pipeline spills wwere displayed on easels along Queen street as volunteers stood by to talk with pedestrians about the Kalamazoo spill and other spills. Nikki Skuce of ForestEthics Canada lives in Smithers, British Columbia near the Northern Gateway pipeline proposed by Enbridge to cross central Alberta and BC. Skuce told reporters on the conference call Wednesday that this line would cross more than 800 rivers and streams, many of them salmon habitat. The Northern Gateway pipeline as proposed would cross over 50 First Nations territories. Many have never signed treaties and still have control over their lands. Most First Nations said earlier this week that they oppose the pipeline. In addition, several municipalities that would be impacted have passed resolutions against it.